This is the first in a new Kerala India Travel series on suggested itineraries for trips to Kerala. I have received many queries from people who are unsure about the best places to visit in Kerala, and what’s possible within a certain time frame. These suggested itinerary articles should give you some ideas for planning your trip. Many people visit Kerala on short trips of around 1 week. Luckily, as Kerala is a compact state it is possible to see some of the highlights in this timeframe, especially if you hire a car and driver. I would recommend focusing on the Kerala backwaters. They are unique to Kerala, and one of the most beautiful, relaxing parts of India. 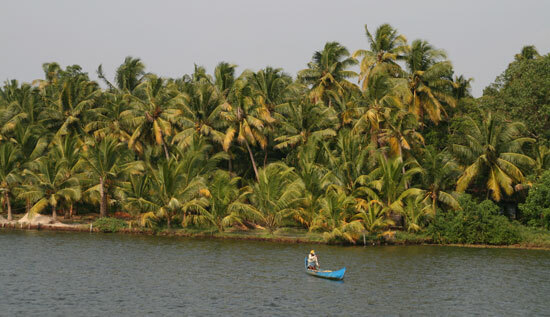 The Backwaters Experience focuses on my favourite part of the state- the beautiful backwaters. A full day’s sightseeing in Fort Cochin is enough to take in the Chinese Fishing Nets, art galleries, colonial architecture and an evening Kathkali performance, and then it’s time to head out of the city. Spend the rest of your week sampling the full range of backwaters experiences, using Alleppey as your base for an overnight houseboat trip, canoe ride and local homestay. The Backwaters & Beach route is similar to the above Backwaters Experience, but includes a day or two at the beach. You’ll still have time for a houseboat trip and homestay, but the trip will be more rushed. Unspoilt Marari Beach is the ideal beach to include on this itinerary as it is located only a short taxi ride from Alleppey, and an hour’s drive to Cochin airport for your departure. I wouldn’t recommend the Backwaters & Hills itinerary in a week for travellers using public transport. It can take 6-7 hours on the bus from Cochin-Munnar, and the same back down to Alleppey. However with a car and driver the trip can be done in much less time. You’ll be able to enjoy the highlights of Fort Cochin, before wandering in luscious tea plantations in the cool mountain air of Munnar, then head back down to Alleppey to explore the backwaters. If you are more interested in wildlife than tea and pretty mountain views, then you could substitute Periyar Wildlife Sanctaury for Munnar, for the chance to see elephants and monkeys. Visiting both would be too rushed in just a week though. If you are arriving in Cochin or Trivandrum and leaving from the other, the Keralan Coast itinerary is the best use of time to combine backwaters and beaches. It starts by following the same route as the above Backwaters Experience but you’ll take an overnight houseboat from Alleppey–Kollam, saving you time and exploring some of the quieter backwaters. From Kollam you can head straight for Varkala, or spend half a day on the fantastic village canoe trip run by the DTPC Tourist Office. The lively beach scene and clifftop views of Varkala beach are only 30 minutes away, and it’s another short hop from here to Trivandrum. On a short trip there are better places to spend your time than Trivandrum, so arrive here just in time for your departure. Hopefully these suggested itineraries will give you some ideas of places to visit in Kerala on a 1 week visit. If you have less than a week I would recommend focusing on just one of the locations detailed above – preferably the backwaters. 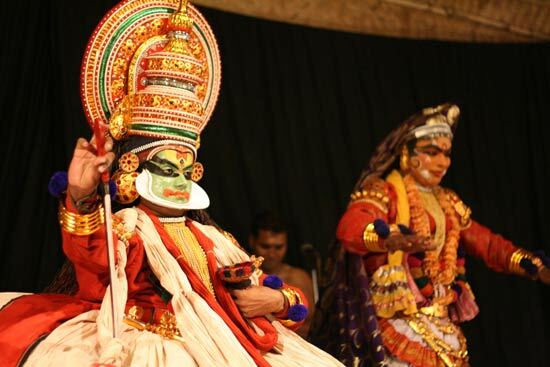 If you have longer than 1 week then see our suggested itineraries for 2 weeks in Kerala. For more information about the destinations covered above read our Backwaters, Beaches, Canoe Trip, Houseboats, Homestay and Top 10 Places to Visit articles. This entry was posted on Sunday, October 4th, 2009 at 8:16 pm	and is filed under Kerala Backwaters, Kerala India Travel, Kerala Suggested Itineraries, Trip Planning Tips. You can follow any responses to this entry through the RSS 2.0 feed. Both comments and pings are currently closed. The blogs have been a great read. We are 2 girls planning to stay at the Marari beach( in this we are including a day houseboat trip at Alleppey and a day’s chilling at Fort Cochi ) After this we have a day and 2 days more days on hand before we catch our flight out from Cochin.. Could you suggest some other option close to Cochin we could go which wouldnt include too much travel? We are 2 girls planning to stay at the Marari beach( in this we are including a day houseboat trip at Alleppey and a day’s chilling at Fort Cochi ) After this we have 2 days more before we catch our flight out from Cochin.. Could you suggest some other option close to Cochin we could go which wouldnt include too much travel? I think the backwaters are worth more than a day trip. Options from Alleppey could include a homestay or a canoe ride to visit villages. You could also visit the Kumarakom Bird Sanctuary near Kottayam. Or if you are interested in temples you could visit Thrissur, 2 hours from Cochin. Thanks Erin, The bird sanctuary sounds like a good idea..
Sure seems like it would be a fun place to visit. See the Taj Mahal as well as the exciting jungles. My name is jay and I am planning for my honeymoon between Dec 4 – Dec 15 I am planning to spend about 6-7 days there but we really don’t want to do too much traveling, instead we like to go out for seightseeing and sped time with each other more! Here is plan; something I put togather for 3 days–What are other good places I can visit aroud Munnar? How far is Alleppey Backwater and what is a MUST seen stuf around Munnar? Thanks in advance for helping! Also, any good airline I can purchase tickets for good price? Should I get a package form an agent or book hotels/airfar by myself? If you don’t want to rush around too much then combining Munnar with the backwaters would be possible in that time if you hired a car and driver to take you from Munnar-Alleppey. It can take 6 hours on the bus, but 3-4 hours by car. I think you have planned all the main sights around Munnar- I’m sure you’ll have a great time. It will probably work out cheaper to book the hotels and flights yourself. I use http://www.kayak.co.uk to find flights. It depends where you are flying from though. If you are flying within India there are lots of budget airlines that Kayak doesn’t cover. Your posts are so helpful and interesting to read. My husband and i are planning our first trip to Kerala this January – about 6 days. We are definitely planning on some time in Thekkady – at the Muthoot Cardamom County. That seems like it would be a bit too quiet for 6 full days though. We would also love to spend a couple days exploring villages, the backwaters (can you do that from Thekkady?) and maybe beaches unless that is overkill for 6 days. Can you suggest a possible itinerary for this? Is Kovalam a good option? Thanks for your comment. It is possible in 6 days to visit the backwaters as well as Thekkady, but I would recommend hiring a car and driver as the bus can take the best part of the day, while the car journey is only 3-4 hours. A homestay in the backwaters would be a great way to experience another side of Kerala. Have a look at my Community Greenpalm Homes Review– I love that place! Thekkady and the backwaters homestay would be a good plan for just 6 days. I think Kovalam is too far away and isn’t as unique as these other parts of Kerala. If you wanted a day at the beach you could visit Marari Beach which isn’t too far from the backwaters, or Cherai beach near Cochin. Have a look at my article Which Kerala Beach is Right For You? Part 2-Central Kerala. A car and driver should cost about 1500 rupees a day, and can easily be arranged in the country through your hotel or the tourist office. we are a group of 7 italian friends. We will stay for a few days in Amritapuri and then we have 2nts for the backwaters. What to choose one day on a houseboat and 1 in a homestay or have an excursion to Munnar? Do you know Olavipe homestay? Dates would be 3 or 4/6 January. Thanks for your help,finally a clear, concise guide which answers many questions. If you only have 2 nights in the backwaters I think one night on the houseboat and one night in a homestay is a good plan. Munnar is too far away for that short a trip. To avoid the houseboat jam you could travel from Kollam-Alleppey on an overnight houseboat. I don’t know Olavipe Homestay but it looks very nice. It should be possible to visit Fort Cochin for the evening if you take a taxi- it is best to check with the homestay that this is possible. I’m heading to Trivandrum for work, but staying in Kovalam. Following the couple days of work I have 5 days free to roam around Kerala, but need to fly back out of Trivandrum. I was wondering if you could help recommend an itinerary for me? I’ve never been anywhere in India before, but am really interested in outdoorsy stuff more than sightseeing. I’m interested in seeing a wildlife reserve (or at least seeing animals somewhere other than a zoo), doing a backwaters tour (probably by canoe). Would you be able to offer any suggestions? Oh, I should mention I’m travelling alone as well and on a fairly tight budget (around £200). I would head first to Kollam for a day to do the backwaters canoe trip, before heading to the Green Palms homestay near Alleppey. This would be enough for 5 days and you would definitely see lots of birdlife, but not necessarily animals. For that you would need to head to Periyar (although even there sightings aren’t guaranteed). It’s about 6 hours on the bus though from the homestay so it would use up a lot of your time, although is doable. An alternative to Periyar would be to go to Cochin and visit the nearby Elephant training centre, where you can wash and ride elephants. I hope this helps. Have a great trip. Your website and content is great and helpful. We should be starting from Delhi on 4th Jan , early morning and returning back on 10th Jan. Flights etc are booked already for these days. We want to visit Hills ( Munnar), Backwaters ( Alleppey) and Beaches during our travel. Can you suggest what should be our itinerary for our trip? Thanks in advance. Awaiting your response. i’m planning to go to kerala with my family for one week trip i’ll be leaving bangalore on 23rd dec and returning on 31st dec. i’ll be staying in kothamangalam.i request you to suggest some places to visit in kerala. from the place i stay .if it is 200km from the place i stay that’s fine. I need a plan to spend a week in and around cochin. It would be greatful of you if you could send me the details of your personal experience or your friends. expect to get a reply from you guys.. Thanks for helping out people in exploring Kerala! My wife and I are planning a 7-8 day trip in July. I have heard it is an amazing place in monsoons. but recently a friend told that it might be a difficult place to move around during monsoons, is that the case? Also, can you pls help us with some options we can explore. I wanted to spend a couple of days on houseboat and also explore Munnar/thekkady. The monsoon can be a problem – you might need to allow more time to get to Munnar in case of flooding, but it really depends on how bad the rain is at the time. I’m sure you’ll still have a fantastic trip and the rain can be very dramatic. hello erin, im planning a trip to kerala. v r a gang of five, and v hav a time of 1 week, wat places do u suggest to visit and v would love to see boat races and staying on boathouses, reply ASAP. Hi, I am planning to visit Kerala during Diwali time. Planning for 4 Day trip. 27th October to 30th October. We are in Mysore. We want to spend some time enjoying the nature. Need places like backwaters, landscapes, boating etc.., No need of any adventure spots… Please help me out in having a best trip to Kerala.. Thanks in advance. Me and my family of 5 are visiting Kerala from jan 9 ,2012. -14 jan and will be flying to and back from kochi …. I have checked out many sites with different itenaries but still want ur view . I Wud like to see some of kochi , visit perriyar sanctuary, munnar, house boats, visit a waterfall , go on atrek or the springs And have the famous ayurvedic massage. Wud love to hear from you. I, along with my parents and brother, am planning a 4-5 days trip to Kerala during the new year’s time. We are planning return flight journeys from Delhi to Cochin but do not have much idea of the must see places in Kerala. Please suggest a macro itinerary that includes the back waters, wild life sanctuary visit and experience of the house boats too. Not your if you are still reading the posts as its been a while since saw you writing. Articles are great, so think you are best one to help out currently . Here is the situation , I have planned a road trip come this weekend. Along with a friend of mine, we are heading to Kanyakumari from Banagalore first. Then from there we are heading to Trichur. Can you suggest a few places in and around Trichur. Thanks for writing a lovely blog. My wife and I are planning for a kerala trip between 7th Aug-12th Aug (4N/5D) from Bangalore. I read about Alleppey’s snake boat race which may happen on 11th Aug this year (correct?) and very keen to watch that. Also, i want to celebrate my wife’s birthday (8th Aug) on a houseboat. This would be my first visit to kerala. We are interested to explore backwater and beaches to have unique experience. Can you please suggest an itinerary? I along with 3 friends of mine are planning a kerela trip this August. What do you think should be the optimum duration of the trip so that I can enjoy all the sights and essences that Kerela has to offer, right from the backwaters , the houseboats,the beaches , periyar, munnar, and the Ayurvedic massages. Two weeks would be great.